And the baby is expected any day now, so I'd better get this in the mail! Also it snowed today... The kids are excited. I was... not so excited. I went with giant spirals, but as always with giant things, the mistakes become more obvious. 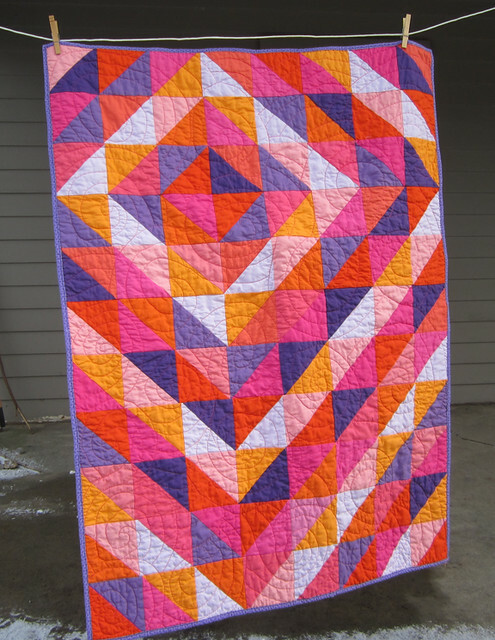 Though, if one was all that concerned with hiding her mistakes, she wouldn't be quilting with hot pink thread. I used about 10 inches of this tone on tone purple print at the bottom after much internal debate. Because the back is mostly lavender, purple seemed a better choice than pink or orange, or even solids. 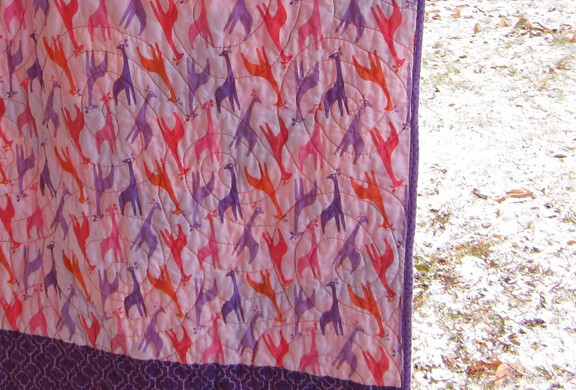 Here are the other posts on this quilt: Half Square Baby Quilt and Plots and Plans: A Baby Quilt. 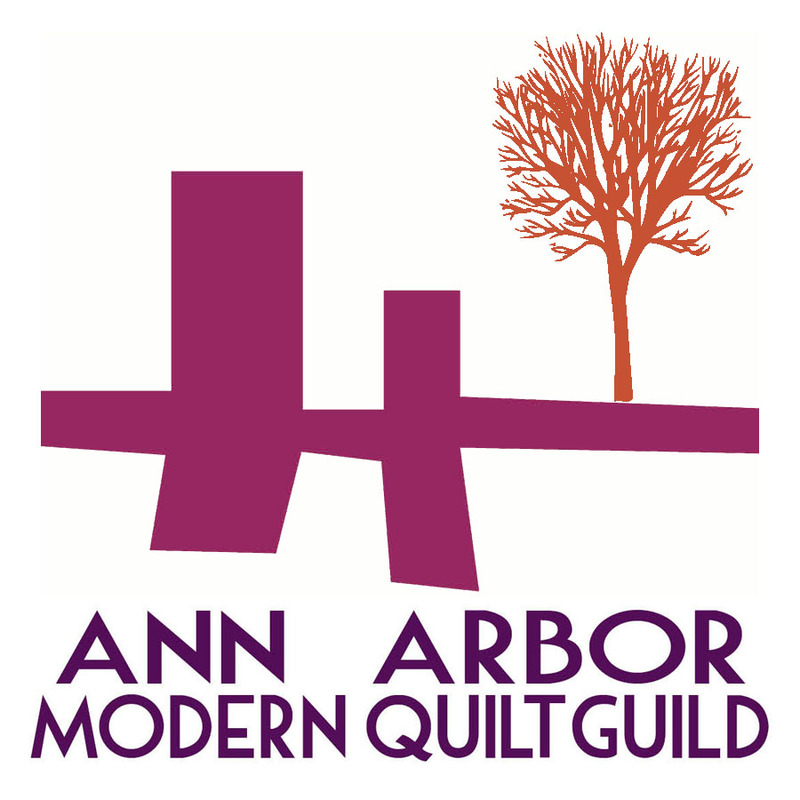 I showed some of my old quilts this week at the Ann Arbor Modern Quilt Guild, as a member showcase. I took a picture of this one, because it's not much around these days. 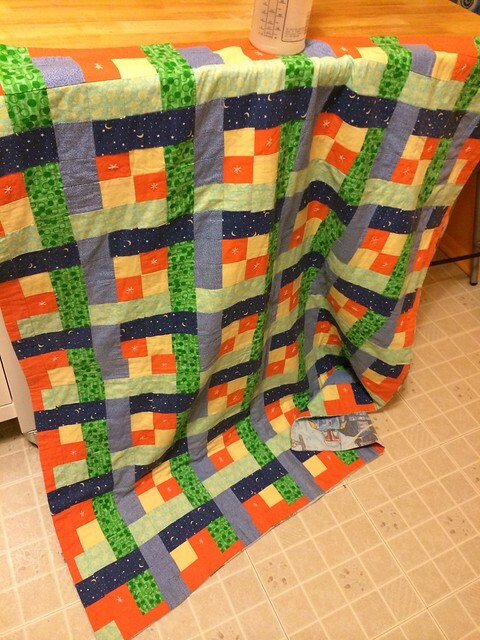 This quilt generally resides at my younger child's daycare as a napping blanket. It's not bound (it was turned inside out, I have not clue as to how that was done, though I did it.) It's tied, sort of, with embroidered stars. It's backed with a Star Wars sheet. The block is Woven Ribbons from Quilter's Cache. Though the border is my own invention. Also, wouldn't be easier to piece this as a log cabin? huh. Anyway! I've got more sewing to do. Cut my first Christmas projects out last night! I'm writing a list, and trying not to take on more projects... no matter how insistent they are.